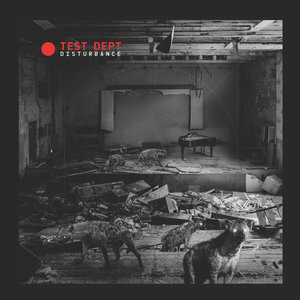 Test Dept's Disturbance is precisely what the dark uncertainty of the present moment calls for: a primeval blending of ancient ambiance and modern tech, building fast and furious into a soundtrack that batters the fragile Quotidien present with a beautiful rage. Since their formation in 1981 Test Dept (or Test Department) have provided a soundtrack for England's conscience. Their violent and aggressive rhythms, punctuated with experimental and industrial sounds, belie the intelligent lessons of their lyrics and the expansive concepts behind their elaborate stage performances. Test Dept is one of those bands whose call for a kinder, gentler world emerges in cacophonous, percussive rage. Their resistance to the violent imperialism and heartless capitalism of ruling regimes in the UK and beyond takes the form of frenetic mimesis, mimicking in art and sound the furious cry of the hopeless and dispossessed. Musically their reach is impressive. In addition to the powerful, industrial protest pieces found on albums like Ecstasy Under Duress (1982) and The Unacceptable Face of Freedom (1986), it's their ambitious concept albums which have produced some of their most impressive work. Pax Brittanica (1991) offered a brilliant and stylistically diverse sonic history of the rise and fall of the British Empire. Gododdin (1989, with experimental Welsh theatre troupe Brith Gof) recreated an ancient Celtic tribal battle using modern cars and industrial scrap (the neoclassical soundtrack is sensational). Never afraid to experiment or move outside their comfort zone, they've even ranged into techno, demonstrating versatility with a variety of musical styles, and an ability to adapt those styles to convey the unabashed political messaging and emotional vitality which is perhaps the most trademark characteristic of their work. Never just a musical group, their artistic ethos was best expressed in equally ambitious stage shows, and encompasses film, photography and even sculpture as well. After the requisite break-up in the late 1990s (what protest band worth its mettle didn't falter under the existential angst induced by the looming millennium? ), several of the original members coalesced again in the early 2010s, eventually performing and recording again under the Test Dept moniker, albeit with a number of new members and collaborators. One can't help but see Test Dept's mimetic accompaniment to popular history echoed even in their hiatus over the past couple of decades. Fading away in the years following that collapse of the Soviet Union which was purported to herald the 'end of history' through the emergence of a totalizing neoliberal world, Test Dept re-emerged coincident with our discovery that history was, in fact, far from over, and the discourses of left and right, socialism versus capitalism and utopian dreamers versus conservative bogeymen were, in fact, simply donning new suits of armor for the next battle. Fiscal austerity. Income inequality. Joblessness. The looming threat of nuclear war. It is an ironic statement on the fragility of human progress that many of the worst socio-political phenomena which characterized the early 1980s (and were adopted as themes by bands like Test Dept) appear to have returned, despite the ostensible progress one would have hoped the world would have made in the intervening 40 years. If it seems our political world is stuck in a never-ending tape loop that simply becomes more worn-out with each rotation, it falls to Test Dept to provide a soundtrack for the renewed struggle. Just as the forces of socialism and anti-austerity resistance surged back into prominence in the UK and elsewhere, so Test Dept has emerged musically resurgent with Disturbance. The album is reminiscent of much of Test Dept's earlier work, yet new enough to excite, and succeeds both as a concept album as well as a collection of well-crafted tracks. "Gatekeeper" offers entrance to this enthralling musical journey by means of a ritualized opening, swirling with ethereal voices, shamanic drumming, harsh chanting: "Europe's soil heaving / ... / walls divide us / history denies us..."
"Full Spectrum Dominance" builds electronically with the rotor-like circularity of electronic beats, sampled voices in the background, conveying an unintelligible rhythmic urgency. "Speak Truth to Power" is a Laibach-esque industrial anthem of '80s derivation, menacing horns and orchestral synths building to a crescendo as the harsh vocals decant neoliberal poetry: "The future is here / The past rules the present / Are we witness to / The triumph of capitalism? / ... / The race to the bottom / Is getting faster / Media coercion / With a bankrupt ideology / The blind obedience / To a broken authority / Hard choices / Hard times / Poverty is a crime / Austerity is a lie..."
Test Dept don't dance around their politics, or bother with oblique symbolism. Their politicized lyrics hit you over the head with a hammer-like bluntness (accompanied, just for good measure, with equally blunt, hammer-like beats, as though to underscore their point). "Information Scare" opens more subtly, with buzzing industrial scythes and distant horns, before exploding into a ritualized dance party, dark beats and frenetic rhythms accompanied by dystopian, anti-clerical lyrics. "GBH84" evokes the industrial chanting of early '80s noise bands, vocals dragged out like melting slag on a conveyor belt: "Zero production / zero hours / industrial heartland / urban power". This is Test Dept's method, their Janus-like lyrics pointing to the future in the present, evoking hope and despair simultaneously; the oppressive tools of the present recast as the liberatory vanguard of a future age. "Landlord" is another raging, beat-driven electronic whirlwind, while "Two Flames Burn" offers a gorgeously restrained, ambient harmony of gongs aiding and abetting more sampled protest chants and electronic rhythms. "Debris", echoes this more restrained, Coil-like electronic ambiance, the very quietude of the piece an ominous and disquieting dissonance from the tracks which preceded it. Disturbance is precisely what the dark uncertainty of the present moment calls for: a primeval blending of ancient ambiance and modern tech, building fast and furious into a soundtrack that batters the fragile Quotidien present with a beautiful rage into which the listener yearns to hurl themselves, body and soul.